Michael Duff watched from the stands as Burnley's under 23s lost 2-1 against Millwall at Turf Moor in the Professional Development League. The former Northern Ireland international, who had coached the club's under 18s after hanging up his boots, was expected to be confirmed as the new Cheltenham Town boss later today. Duff, who left the Robins for Burnley for £30,000 – and a friendly at Whaddon Road – back in 2004, was set to replace Gary Johnson. 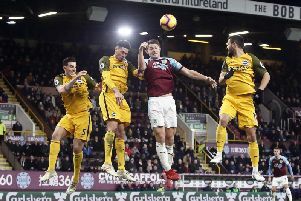 The Clarets centre back earned a place on the Wall of Legends at Turf Moor after making 383 appearances and earning three promotions to the Premier League. Duff, who scored the goal which sealed the Conference title for Town in 1999, as they reached the Football League for the first time under Steve Cotterill, was housed in the Bob Lord Stand as Jon Pepper took over the reins. Duff arrived with the Clarets trailing to Lewis White's early opener. The striker turned Oliver Younger on a sixpence from Issac Olaofe's cross, taking the defender out of the equation, before thumping the ball home via the underside of the crossbar. Clarets defender Anthony Glennon's stinging drive from the edge of the penalty area was blocked following good work from Olatunde Bayode down the right hand side as the hosts looked to restore parity. Dan Agyei's attempt from distance was then comfortably gathered by Ryan Sandford but the striker gave the Lions stopper more to do in the lead up to the equaliser. Bayode drew the foul from Michael Parker midway through the first half to provide Glennon with the opportunity to whip the ball in to the box from the set-piece. The full back obliged and after Agyei's header was well saved by Sandford, Tinashe Chakwana followed up to level. Olaofe stooped to steer the right back's delivery goalwards, though goalkeeper Adam Bruce was never pulled out of his comfort zone when making the save. The 19-year-old then made a vital intervention inside his own box, blocking Agyei's effort after the striker collected Mace Goodridge's incisive pass. The fixture was heading for a stalemate until Millwall substitute George Alexander netted in the last minute of the game. The 17-year-old, son of Gary Alexander, picked out the corner at the second attempt from close range after his initial strike had been blocked.